New York, New York. If you can buy chucks there, you can buy them anywhere! There’s shortage of brightly colored canvas in New York this summer, and it has nothing to do with the decline of the East Village art scene. I discovered it at the Athlete’s Foot store across from Lincoln Center where I went to buy a pair of Converse All Star sneakers. The order arrived a few weeks later, and Athlete’s Foot now has plenty of All Stars, but visits to other stores revealed a definite All Star shortage. At home, I pulled out a phone book and called six sports-shoe stores. When I asked for All Stars, a couple of people just laughed. One guy said there would be a two month wait. Another said he’d got some in two weeks before, but “they shot right off the rack. They’ve become a fashion statement.” The shoe is most popular not with basketball playing teens — who prefer Air Jordans — but with artists, bohemians, people who walk and don’t run. Bruce Springsteen owns 28 pairs. In fact, the shoe is the No. 1 sneaker in America. All Stars will soon be made in South Korea, but’s these will be children’s shoes, and won’t reach our shores until the fall. Which put me back out on the streets. Converse All Star Chuck Taylor high tops are always a fashion statement. In the basement of the Village Army-Navy store, on Christopher Street, I found two colors: white and black. 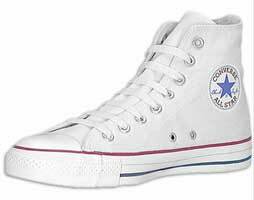 I picked up a white sneaker, ran my hand along the sleek rubber contours, and fondled the canvas between my forefinger and thumb. “Size 11,” I said to the salesman. “I could have sold 300 of these if we had enough.” he said as he unwrapped a squeaky-clean sneaker and laced it up. I pulled out $27, buying a bounce to my step and no small peace of mind. “I know,” I said.